Posted on 3/10/2009, 8:58 am, by batgirl, under Tute Tuesday. 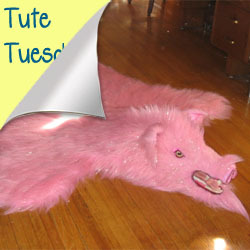 This week on Tute Tuesday we have one of my favorite projects ever, the fake taxidermy rug. This amazing project is original, hilarious, and incredibly well-crafted. You can make your own animal-friendly beast rug for yourself – Hemi*Housewife will show you how it was done. If you are looking for a unique project to brighten your home, look no further! Actually, do look further. Our Home Sweet Home board is just bursting with awesome decorating ideas for your one of a kind home, whether it’s a dorm or a mansion. But, on to the tute! If you make this project, or have a comment, please share! We’d love to see what you’re working on!